WASHINGTON, D.C. -- When GOP presidential candidate Mitt Romney visited an Ohio coal mine this month to promote jobs in the coal industry, workers who appeared with him at the rally lost pay because their mine was shut down. EDMONTON - A proposed coal mine on Hinton’s doorstep could cost $1.5 billion if fully developed and bring more than 500 new jobs to the town. A lynchpin in Montana governor Brian Schweitzer’s plan to shift the Big Sky State from an agricultural economy to energy extraction, coal exports center around energy companies’ bid to open vast new areas in Montana to mining. 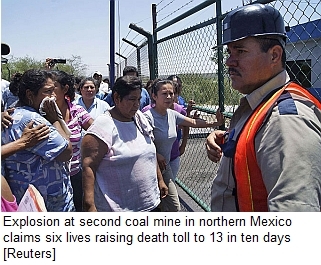 These are tough times for coal miners. A combination of cheap natural gas in the United States and slowing demand in Asia has devastated the industry in recent months, driving prices lower and crushing the equities. ANYONE traveling on Interstate 77 just north of Charleston, W.Va., can’t miss the billboard perched high above the traffic, proclaiming “Obama’s No Jobs Zone,” a reference to increased regulations on the coal industry and mountaintop removal mining. Like countless other bits of pro-coal propaganda that have sprouted over the last few years across Appalachia, the sign is designed to inflame tensions — and by all counts, it’s working. CHARLESTON, W.Va. — For more than a quarter-century, government efforts to end deadly black lung disease have hit various brick walls, built by opposition from one side or the other. PRESTONSBURG, Ky. — Ray Marcum bears the marks of a bygone era of coal mining. At 83, his voice is raspy, his eastern Kentucky accent thick and his forearms leathery. A black pouch of Stoker’s 24C chewing tobacco pokes out of the back pocket of his jeans. “I started chewing in the mines to keep the coal dust out of my mouth,” he says. Protesters of a mining conference in downtown Vancouver were throwing more than just rocks. Cardero Resource Corp. has submitted a project description for its Carbon Creek Project, a proposed open pit coal mine located in the Peace River Coalfield in northeastern BC. As part of the federal budget, the government has proposed a complete overhaul of federal environmental assessment in Canada. The repeal and re-enactment of the Canadian Environmental Assessment Act (“CEAA”) and amendments to other federal environmental legislation amount to the most significant change in federal environmental assessment (“EA”) since the legislation was first created decades ago. These changes are vast and their full impact on the mining industry, particularly in Ontario, will not be known for years to come. TOKYO — A partnership formed by JX Nippon Oil & Energy and Xstrata Coal will invest $35 million on a preliminary study of the Suska coal project in eastern British Columbia. NEW GLASGOW, N.S. 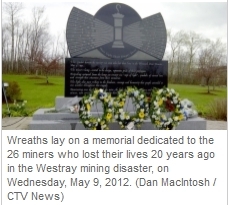 — Twenty years after losing his brother in the Westray mine disaster, Allen Martin recalled treasured moments from his own life that his brother Glenn missed. "My daughter growing up, the fishing trip, our grandchild," he said as he stood before a granite memorial that includes Glenn's name and those of 25 others who died in methane and coal dust explosion on May 9, 1992. It was a tragedy on such a scale, today it's difficult to imagine. I applaud our papers for continuing to print both sides of the debate regarding the Raven coal project. Several readers have written recently that they are concerned about the future of jobs on Vancouver Island, suggested that a regulated underground mine is somewhere they would be comfortable having their children work, and suggested that opposition to the Raven coal mine is misinformed. Many citizens feel troubled when they hear that a new mining operation or similar development may start up near their community. On the one hand, a new development suggests the prospect of new jobs and economic prosperity. On the other hand, citizens worry about the impacts that mining and industrial developments might have on their community. This paper discusses some of the options for local government to address the impacts of mining on residents and the natural environment. The purpose is to make communities and local governments aware of the tools at their disposal, generate discussion as to what steps a community might want to take, and provide examples of how bylaw powers have been creatively used in other BC communities. The good news is that local governments are not powerless. In Ms. McComb's recent letter "Changes must be made to keep jobs on the Island," she seems to be making the case that the proposed Raven Coal Mine project is the key to future growth and prosperity in our communities and the beacon of hope for young workers and their families. BILLINGS, Mont. (AP) — U.S. coal exports reached their highest level in two decades last year as strong demand from Asia and Europe offered an outlet for a fuel that is falling from favor at home. The fundamental flaw of Mr. Alf Randall’s stone-age philosophy is that his home is not located in Fanny Bay and he and his family do not rely on Cowie Creek water sources for clean drinking water.